If I were to recommend any superhero comic published today above all others, then it would be this. It belongs to no long line of convoluted soap-opera shenanigans, but is self-contained, witty and pithy, with so much to socio-politically say. It rises above the genre. "You know, you're really quite interesting considering I hate kids. How the hell did that happen?" "My Dad didn't abandon me." But it may prove to be the most pivotal sentence uttered in this desperate, dirty, internecine against-all-odds fight to turn the tables and retake the world from its conceited and contemptuous, self-appointed saviours: the superheroes. That scene will extend far further into the fray. The book begins with a brief moment of paternal bliss and, when priorities are finally relearned, then it will be revisited and there will honestly be moments of "Awww!" Before then, I'm afraid, there will be moments of awe and gore and a great deal of grievance, with far more to come; for I should warn you right now that this is far from the end. More considered, meaty and wider in scope than the hugely enjoyable but comparative light entertainments that Mark Millar has produced recently, this epic has been all about family. Family, society and the generation gap - love, jealousy, disappointment and disillusionment giving rise to revulsion, self-seclusion and feuds - but it has been far from obvious in that your elders do not necessarily know better and those regarded as black sheep in youth often have the makings of more compassionate individuals with a more healthy and balanced sense of perspective, free from prejudice and presumption. 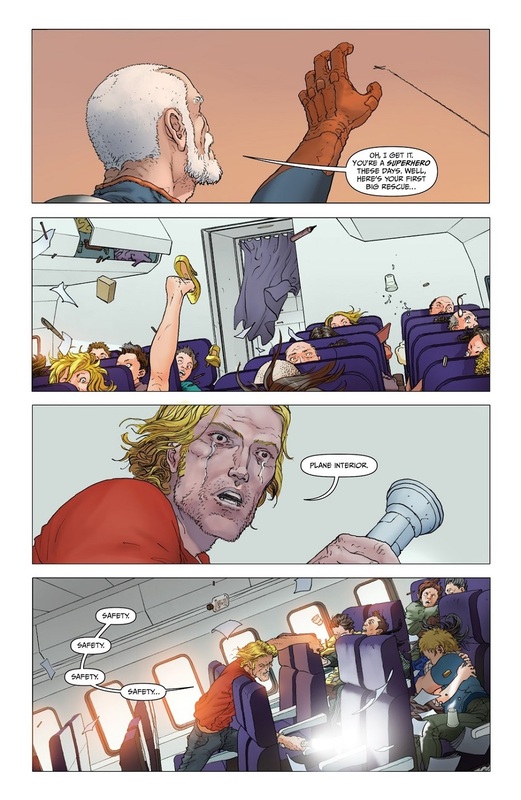 Incorporating first JUPITER'S LEGACY VOL 1 then its prequels JUPITER'S CIRCLE VOL 1 and JUPITER'S CIRCLE VOL 2, it has been so cleverly structured, and that is the order you should read them in before delving in here. The two CIRCLE volumes inform what you'll find and give it far more emotional weight. "I turned because I realised that superheroes were little more than uniformed agents of a corrupt ruling class." He tried to help stem the blood loss during the police reaction to the Race Riots. Although, you know, you could extend that observation to the two real-life superhero comics' corporations, each attempting to blot out every other genre published to maintain their hegemony over their US and UK's culpably ill-read, retail co-collaborators. I know I do. "We were great at throwing the poor in prison, but the real crooks out there were the capitalist elite preying on working men and women." Bankers and bought politicians. Millar made the same point from a different angle in THE AUTHORITY. "You see, the world didn't like me and in the end I didn't like it back. I tried my best to fight oppression, but America's happiest ruled by liars." I don't think I have to spell that one out for you. America has been overtaken by liars, namely one post-human Walter and his nephew, son of the brother he helped murder along with his sister-in-law. In brazen public, on her suburban lawn, and in a mass beating, Nice! Walter's brother's daughter is still at large, holed up in fear of her life with her pre-teen son Jason and her boyfriend, a ne'er do well son of that ne'er do well father once called Skyfox. Those three fugitive renegades are all that are left of any resistance, and the two parents never amounted to much. One preferred the glamour and financial gain of publicity portfolios and media lights; the other layabout didn't even impress his prospective father-in-law: useless offal. I do love an underdog, don't you? 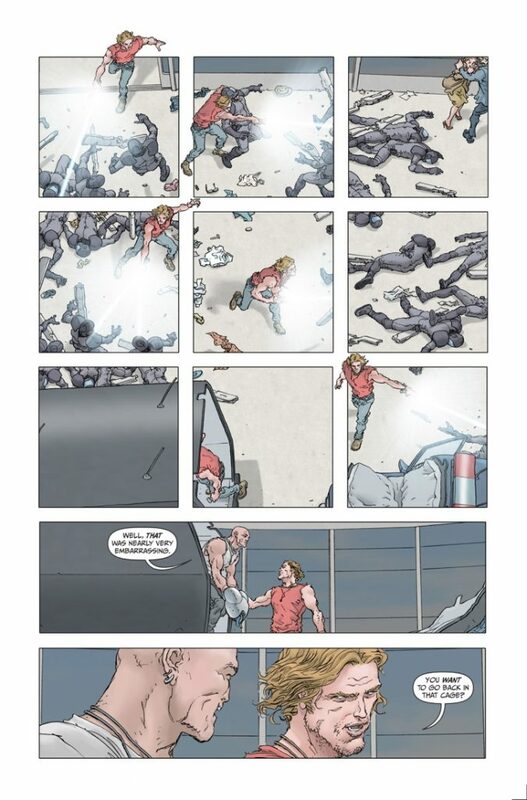 Artist Frank Quitely (THE AUTHORITY, ALL STAR SUPERMAN etc) owns every single second of this. It wouldn't work half so well if he didn't. For a start, he is a dab-hand at keeping things real with a casual, chic civilian fashion sense right up there with THE WICKED + THE DIVINE's Jamie McKelvie, When his figures' forms are vulnerable then you will know about it. 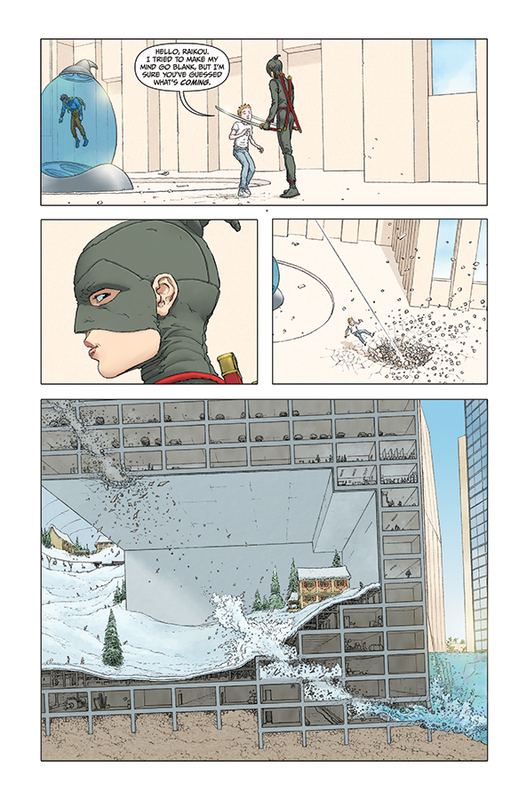 Quitely does it with comparative scale, and with the quality of his line which can become tremulous. In that way I'd compare him to HEATHEN's Natashi Alterici who comprehends precisely how much difference a broken line means to movement. 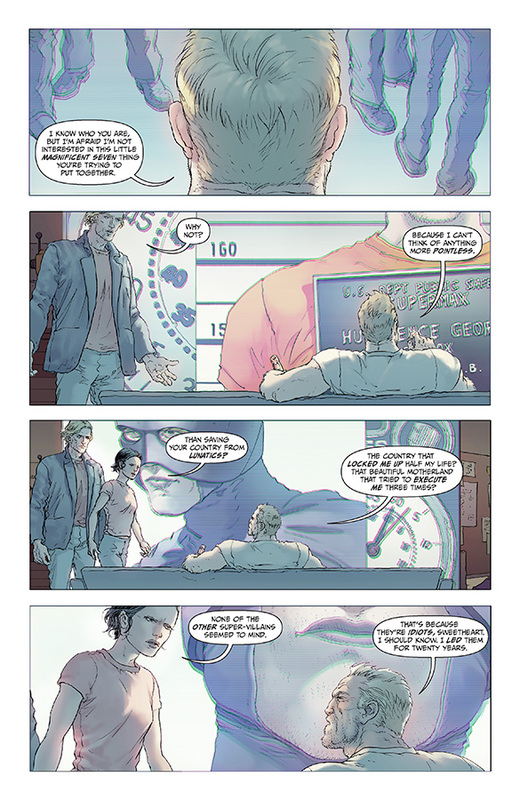 But as any reader of WE3 will know, Quitely is also a master craftsman of pin-point, balletic choreography more than a wee bit enhanced by body language. It's evidenced at its best here by the improvisational, desperate detour undertaken by Hutch Junior (Skyfox's son and Jason's dad) into the Charles de Gaulle airport in Paris when his teleportational wand has gone wonky and run out of juice. Almost a spindly, stick-figure and so vulnerable target upon arms-akimbo-entry, he is buffeted about by superior fire-power, but once Hutch has reach his unexpectedly lo-fi and therefore oh so funny recharging pit-stop, his body language changes dramatically in keeping with his rekindled confidence, and he dishes out his dismissive justice - wham, wham, wham - with erect and equanimous, almost off-hand indifference and efficiency. Oh, I'm sorry: did I make this out to be a meandering stroll in the park? Expect brutality, but a brutality that will mean something to you involving characters who you will come to care about before they are dispatched, forever, with no hope to follow. 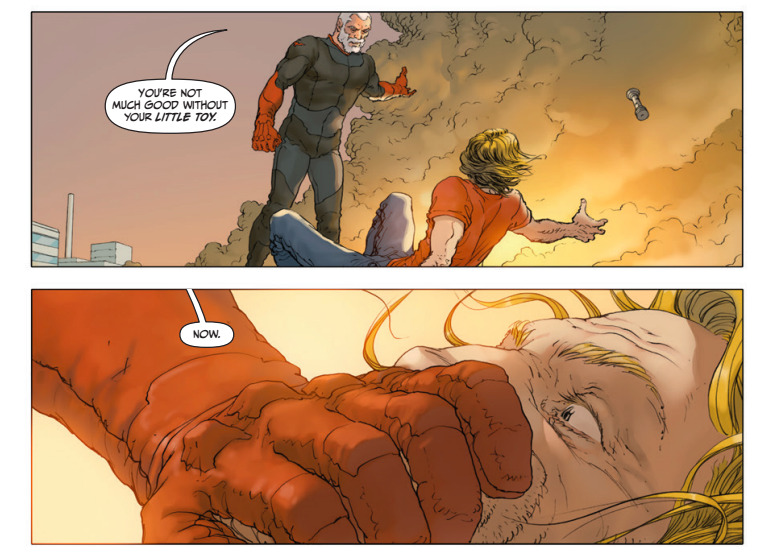 Also: if you do like superhero plot mechanics - this can only be resolved here after that power proves pivotal there - then you will grin your f***ing heads off. There may be only three of them left, but oh, they got game! 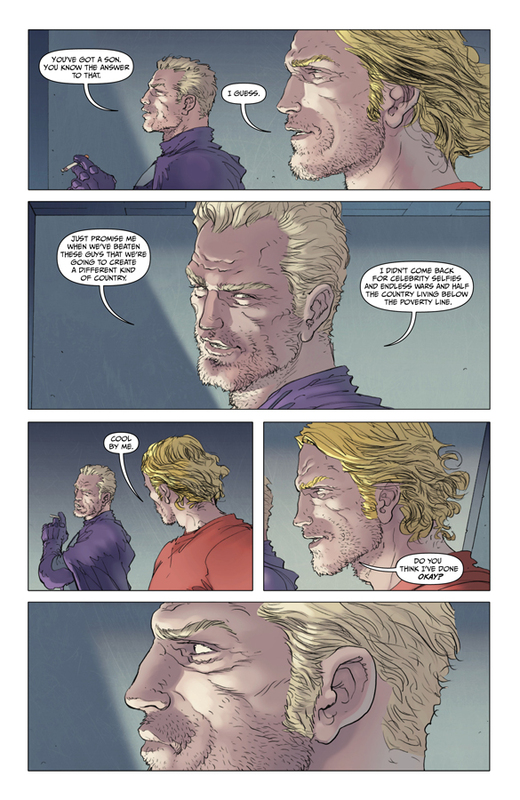 Fatherhood is evidently very dear to Mark Millar's heart and he's at his most profound when addressing it. MARVEL 1985 drawn by Tommy Lee Edwards is an understated and underrated gem full of quiet and kind consideration when it comes to step-father and son. 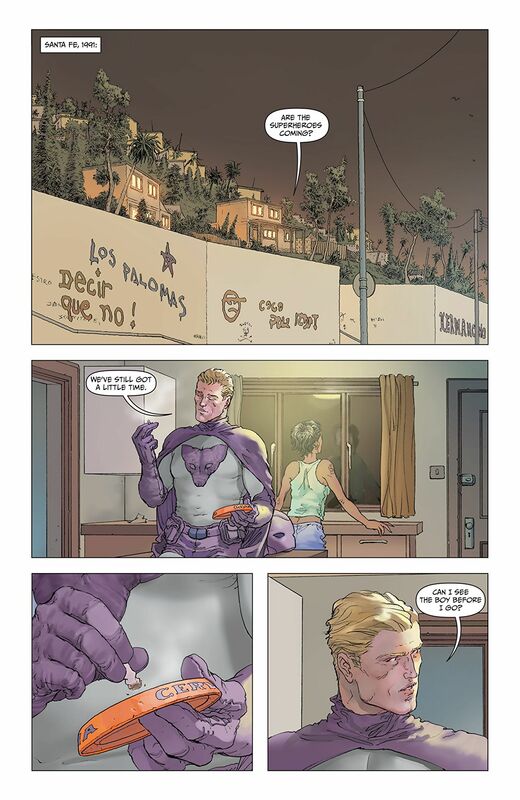 Its title suggests something esoteric, requiring prior knowledge of a clumsy corporation's sprawling universe, but it's actually quite the reverse: a self-contained one-shot, fully accessible, to the left of the main Marvel Universe, partly about trusting in the younger generation's perspicacity and perception.